The Sony Ericsson W995 is a beauty, like all their flagship Walkman phones. This one has 3G, Youtube playback, stereo speakers, aGPS for use with Google Maps, and an honest-to-goodness 3.5mm jack. The slider has a 2.6-inch screen, and can serve up media files using DLNA over Wi-Fi, from its 8GB store. The 8MP camera even has face recognition. Although I've always loved Sony Ericsson phones, without carrier subsidies in the US, they're hard to justify as a purchase. The lack of an app store is a problem, but the other issue, music store support, has melted in the last year with the rise of the DRM-free music sources like Amazon and others. Get a complete on-the-move entertainment experience with the W995 Walkman™ and its optimised video playback style and performance. Debuting on the W995 Walkman™ is Media Go™ which transfers, plays and organises your entertainment, in most file formats, to your mobile phone simply and effortlessly. Barcelona – February 15, 2009 –Keep amused like never before on one powerful video mobile phone; watch news, TV shows or blockbusters in premium video quality or check out the latest videos from YouTube™ using Turbo 3G or Wi-Fi™. Complete with an 8.1megapixel camera and Walkman™ player, with clear audio experience, the W995 Walkman™ is the ultimate mobile phone to keep you entertained when on the bus, lunch break or waiting for a train. With Media Go™ it's easy to bring your media with you. This unique Sony application makes its worldwide debut on the the W995 Walkman™ and lets you effortlessly and automatically transfer any audio, photos and videos between your phone and computer. You can even find podcasts with exciting content easily from the directory – just two clicks and you're away, and watch the action in all its glory on the bright clear 2.6" screen." "With Media Go™ there's no need to worry about format, resolution and ‘frame per second' anymore." said Alexandre Cardon, Global Marketing Business Manager at Sony Ericsson. "No longer will the video you transferred from your PC to your phone play in low resolution or bad quality. 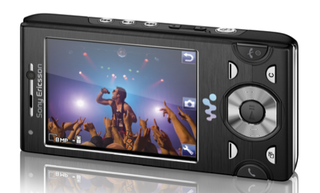 With Media Go™ and the W995 the experience is as good on your phone as it was on your PC." "The W995 Walkman™ phone brings together the very best music experiences of any phone, augments this with best in class video and sharing capabilities to offer the most complete communication entertainment package to date." said Alexandre Cardon. "This powerful mobile phone delivers the best possible video resolution that can fit in your pocket and with enough battery stamina to watch two full length feature films. The W995 also comes complete with the award winning clear audio experience and an 8.1 megapixel camera for the highest quality picture and sound available in a mobile phone." Set the phone on its built-in stand and watch videos with your friends while you pump up the volume on the powerful built-in stereo speakers. The W995 comes complete with excellent sound for both movies and your favourite tracks. Clear Stereo, Clear Bass and the included HPM-77 premium headphones make music on the move feel like you're sitting in a recording studio listening to your favourite band live! For the next level of clear audio experience, in selected markets the HPM-88 noise cancelling headset will replace the HPM-77. To complete the entertainment experience get picture perfect all the time with auto focus, photo flash and face detection. Capture images in their true colours with the 8.1 megapixel camera and you can print pictures up to a full A3 size without having to compromise on quality. * Auto convert – Media Go™ gives you the best quality playback of multi-media content on a mobile phone. There's no need to use extra applications to be able to bring your media with you. * Podcasts – it has never been easier to subscribe and download podcasts. Apart from adding your own favourites, the directory is there to help you to find the new and exciting content. The W995 Walkman™ supports GSM/GPRS/EDGE 850/900/1800/1900 and UTMS/HSPA 900/2100. W995 will be available in selected markets from Q2 in the colours Progressive Black, Cosmic Silver and Energetic Red. Media Go™ will be available for all markets from the W995 launch in 15 different languages.